The festive season rolls on. 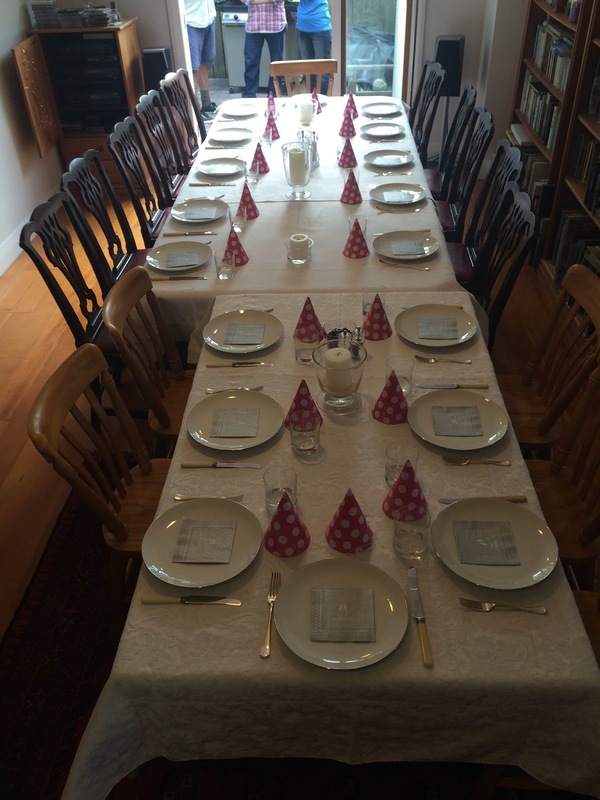 On Christmas Eve we had a sit down meal for eighteen with friends. Great food and company, there were nibbles followed by beef Wellington, potatoes and salad. I offered to bring some homemade snarlers to add to the selection of kai. The children hoed into the food. Calling them children is a bit of misnomer as they are all aged between seventeen and twenty, our twins are the only ones who will still be school next year, the rest of youngsters are at university. The adults who don’t talk about their age but do contemplate, speculate and pontificate about both the past and the upcoming years. Of course this is all done over fine food and conversation. After our Christmas Eve function, with full bellies we headed off my sister’s place for a Christmas Day lunch, this was held mid afternoon. 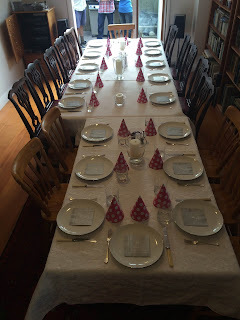 We had eight households present, lots of whanau to share a casual and relaxed lunch. With the newest addition being just four weeks old – she slept in the arms of cousins and aunties, with an occasional feed from mum she successfully created the impression of a blissful new born. However she will not have it all her own way as another baby is expected in the next month, they will have to vie for the attention of the doting adults, and adolescent cussies. Also present were a few pre-schoolers, along with those who have just started school, and some who have finished school. The day had excited little kids, more sedate bigger kids, and some of the parents just pretending to be kids. It was a very enjoyable day, although lunch was the centre of attention, a water fight was held, cricket was played on the road outside the house, as those present enjoyed and appreciated the presence of whanau. The table groaned with food, a ham, chicken, salmon, salads, potatoes, veges and more. 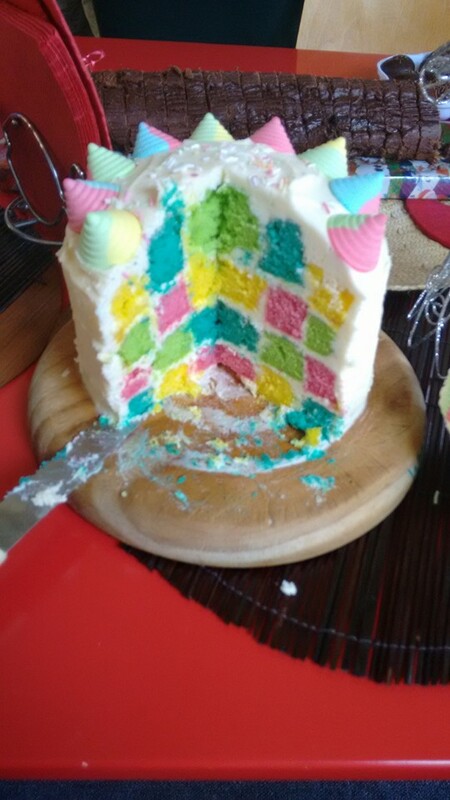 I mention one of the many desserts later in the post. I contributed my version a blue cheese, pear and walnut snarler along with an Italian banger. They were well received. My version of the blue cheese, pear and walnut snarler is a self created recipe that uses a kilo of minced pork – through a 6mm grinder, six pears – stewed and chilled, ¾ of a cup of roughly diced walnut and one hundred grams of blue cheese - frozen and then finely grated. I also add one hundred grams of bread crumbs. 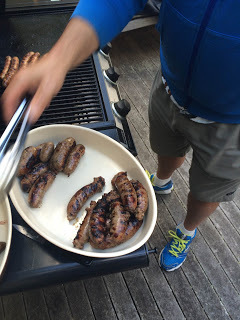 The Italian sausage is a recipe from a UK sausage website. After making this for the first time I doubled the amount of spices from the recipe. I do prefer a bolder tasting sausage. At the Christmas Eve dinner the woman sitting next to me described the blue cheese snarler as “amazing” and “heavenly.” Now here is a woman who knows how to flatter. The Christmas day barbecue was borrowed from a neighbour. They were rewarded with a gift of two snarlers, they asked me where they could purchase the blue cheese snarler, as they were keen for more. This comment was echoed a number of people on Christmas day. I am always ready to receive very positive feedback. These were the best presents I received on the day. We are arrived home we were replete, a great day with the whanau. Roll on the next family event. As a postscript, I have added a photo of a dessert my fourteen year old niece made, she is her mother’s daughter, who specialist area of gastronomy is sweets and desserts. I consider this to be a very impressive creation.